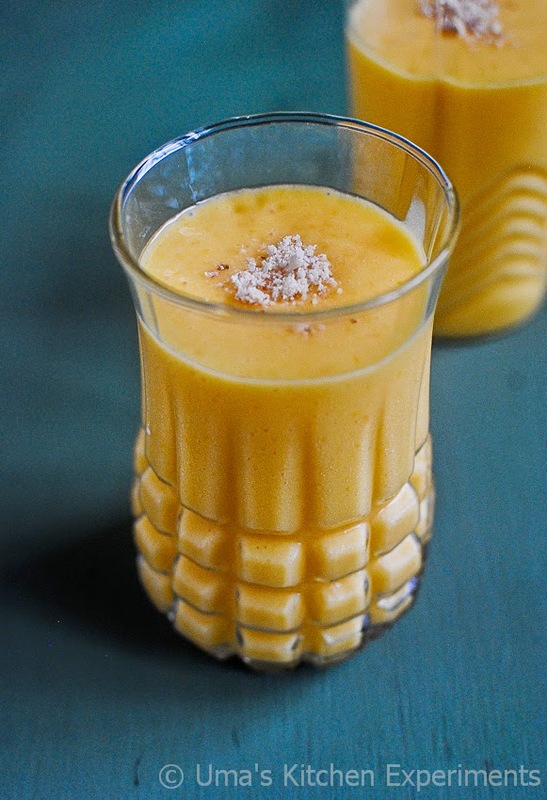 Few would prefer Mango in a chilled way as in milkshakes and Lassi. Some others would prefer it in tangy and spicy form. Few other would go for pickles and very few go for cakes. What is your favorite way of eating mango? My choice is having it in a direct way without any processing :-) There is a bliss in eating/slurping the mango as it is... Do you agree? Once in a while I prepare Lassi or smoothie or milkshakes when guests are visiting home. It is good to serve the mangoes in glass bowls instead serving it in a plate. That's my personal opinion. This time in my house we were left with only one Mango. Before that we nearly finished few kgs of Mangoes. The last remaining Mango was very ripe and so it was difficult to cut it into neat slices. So I thought of making milkshake out of it. I bought Javadhu mango variety which was very sweet and which doesn't require any extra sugar to be added. But the measurement given below is the one which I typically prepare for my guests. Adjust it as per the sweetness of mango or as per your personal preference. 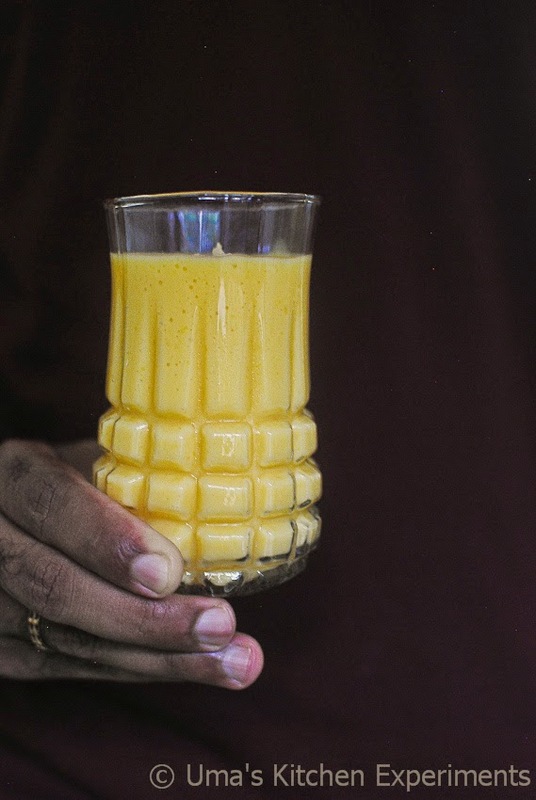 1) Choose sweet, ripe and bright colored mangoes for making milkshake. Peel off the skin and cut into cubes. 2) Add to the blender along with sugar. 3) Blend it for a minutes. 4) Add milk and continue blending for 3 minutes. 5) Pour in glasses and garnish with powdered nuts. Serve chill. 1) I used chilled fresh milk. You can also use boiled, cooled milk for this milkshake.To get thick milkshake, avoid ice cubes instead add chilled milk. 2) I used powdered cashews and almonds for garnishing. yes even I prefer to have a ripe mango all by itself, without changing form! 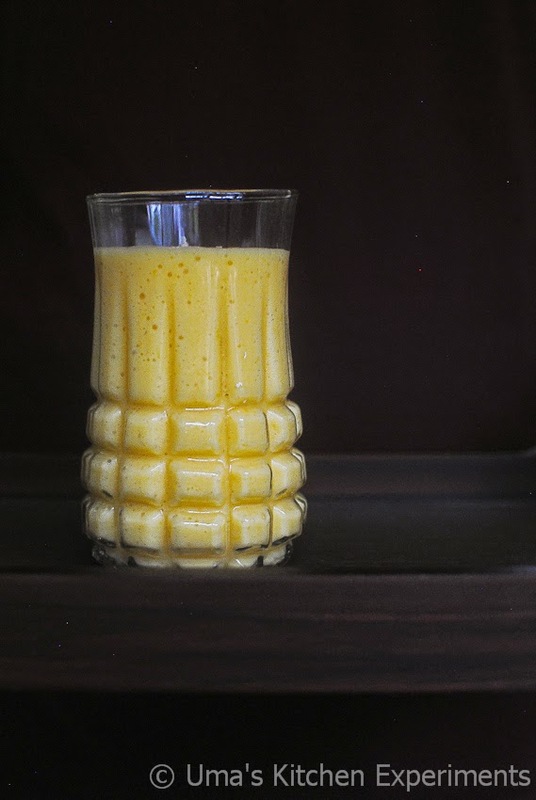 but an occasional juice or smoothie is also welcome....rich creamy and beautiful simple clicks..
Tasty drink, loved the glass, resembles mango pieces. I want that glass and the shake together., those cuts in that glas gives a royal look.